We may be heading into another economic recession soon. Over the last 3 decades, they have come around with uncanny regularity, although we seem to be caught by surprise every time. The fact is that we will once again face widespread economic pressure in the future. 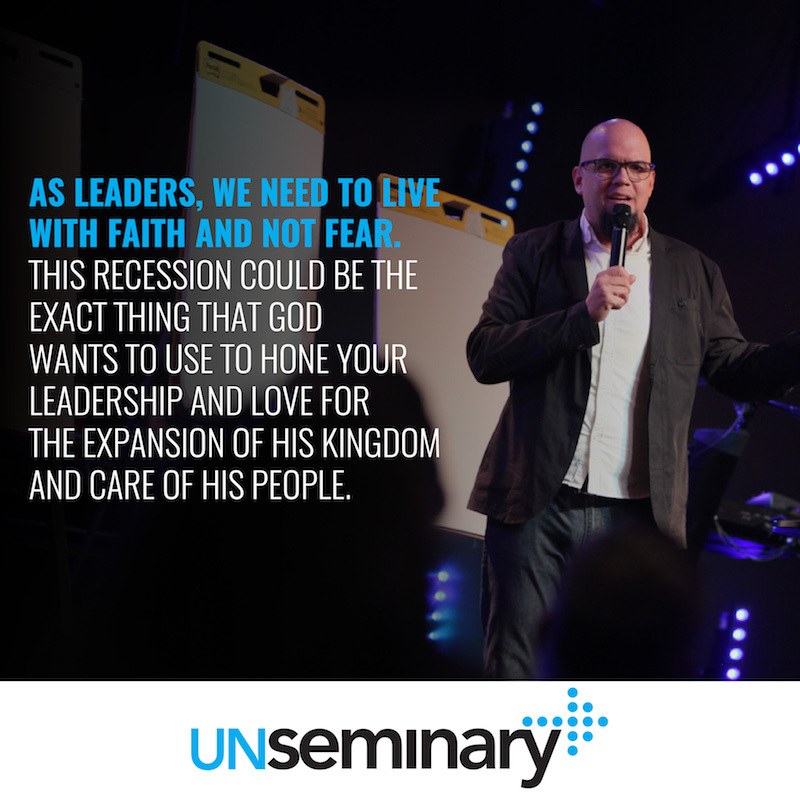 I’m not an economist by any stretch of the imagination but anyone can see that we may be headed for another contraction of the broader economy, which presents challenges and opportunities for local churches. By looking at the timing of recessions in recent history, you can see that we are “overdue” for one. [ref] Although this isn’t an exact method for “predicting” recession, it is a good reminder that they do come around with a regular rhythm every 7-10 years. Are we building a cash reserve? // Although there is some debate in church leadership circles about the role of cash reserves in a vibrant ministry, you should consider if it’s possible to increase your cash position in this current season. At a minimum, churches need to have one payroll on hand at all times, but this amount often isn’t enough to bridge a leaner recession period. A best practice in the broader non-profit community is to have 3-6 months of operational expenses in liquid form that can be accessed during a downturn. [ref] Most churches don’t have near that amount saved. They need to build a cash reserve for a time like this. Recessions typically last for 8-18 months. Consider how you could cover expenses during that time period with potentially decreased giving. Do we need to reconsider future staff positions? // Typically in a local church, the largest line item in the budget is staff salaries and benefits. Unlike discretionary spending, this area is very difficult to deal with when giving takes a hit. During the last recession, charitable giving dipped by 13.4%. [ref] Many churches would need to make staff changes to accommodate that lower giving level. There simply isn’t enough money in the program budgets of a lot of churches to make up that shortfall without cutting staffing costs. If this is the case in your church, should you slow down on your hiring and find a different approach to ministry for the next year? There would be nothing worse than bringing on a new team member and then having to cut back because of shifting economic realities. How will we be ready to help people? // Recessions create new ministry opportunities. People need the support of a local church to navigate difficult times. How can your church rally people and financial resources to meet the need? Rather than viewing this situation as a burden, what if you look at it as a way to make a greater impact? Brainstorm ways your church could mobilize people and resources to help those in need. 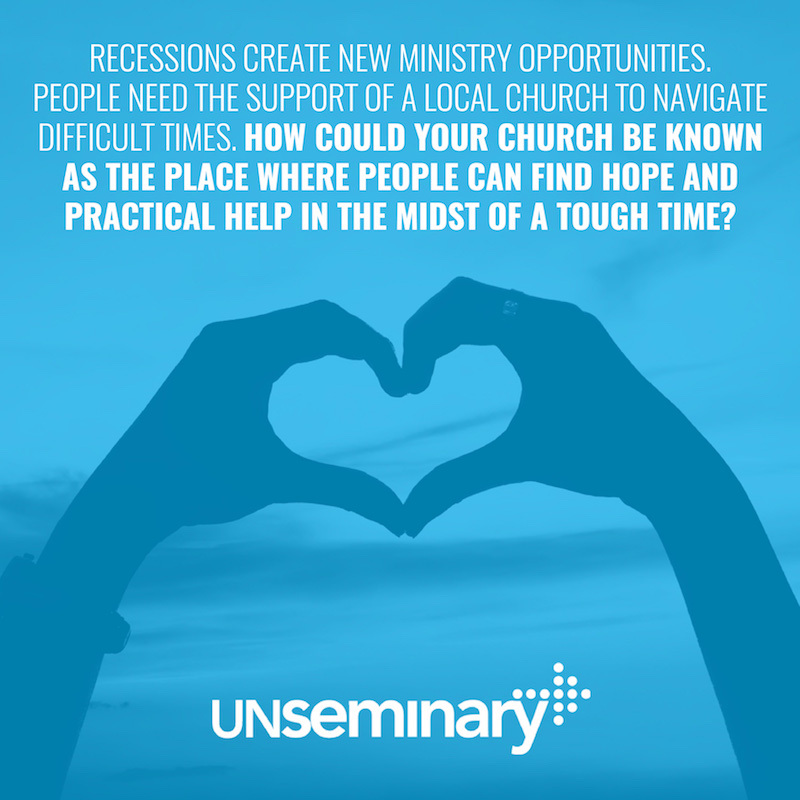 How could your church be known as the place where people can find hope and practical help in the midst of a tough time? How can you help find something for people rather than trying to get something from people? Is there an elegant way to leverage the social network of the local church to help people who are in need of work or who have other practical needs? Should we put a year-end campaign into action now? // One of the side effects of a recession is the need for your church to articulate clearly how giving to the church helps further the mission. You’re going to need to do a better job of explaining how giving to the ministry makes a difference in people’s lives. This is a great gift of a recession because if you embrace it, you will come out the other side a better communicator and resourcer of the ministry. One of the tools that your church could put into action today is a year-end giving campaign that helps people see how giving to the church is making a difference. [ref] A recent study found that 24% of charitable donations are given in the last 45 days of the year. [ref] What if you decided now that this Christmas you were going to do a special giving initiative focused on pushing the mission of your church? People are solicited by many non-profits during that time, so your church should match those communications to the best of its ability! Are your personal finances in order? // Finally, how are your own personal finances? Often, churches that struggle financially are led by someone who is also struggling financially. Is your own personal economy in order? Have you paid down as much debt as you possibly can? Do you have a plan for your money? (Because if you don’t … it has a plan for you!) If you struggle with debt or financial mismanagement, now is the time to deal with it. I’m a huge fan of Joe Sangl and his ministry, I Was Broke. Now I’m Not., which offers practical help and insights into your finances in a non-threating manner. It is possible to be in ministry and thrive financially. This recession might be your motivation to right your financial ship. Do we have data on what happened during the previous recessions? // Pull out your church’s data from the last recession or two and understand what happened. Start with a plan to address that reality. What are the early warning signs that your community is being impacted? // When you look around your community for signs of a looming recession, what could a leading indicator or two be? What help could you mobilize quickly? // Often, we don’t realize we’re in a recession until it’s almost too late to meet the needs of our community. How can we plan for that now rather than waiting? Where would you cut spending? // Gather your team together and give them the challenge of cutting 10% of the budget for a potential “rainy day.” Save that plan … you might need it sooner rather than later. How could this be a vision shaper? 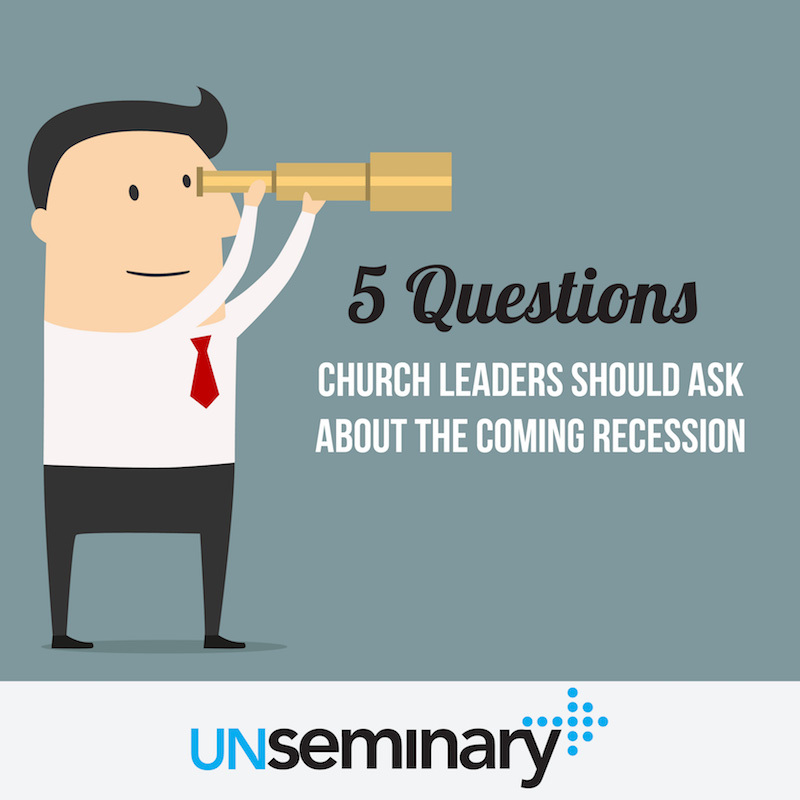 // How is it that God could use this recession to clarify what he’s calling your church to be? Former White House Chief of Staff Rahm Emanuel once said, “Don’t waste a good crisis.” Is it possible to leverage this?